In Santa Barbara, all roads lead to Joe's Cafe. Joe's Cafe is a place where locals and tourists gather, mix, and bask in the resulting jubilant, noisy reverie. There's something for everyone at Joe's. Located at 532 State Street, Joe's Cafe offers a down-to-earth menu for breakfast, lunch, and dinner. The bar is legend in these parts, and the motto on the Joe's matchbook says it all: Stiff Drinks – Stay Late. The restaurant, originally located at 512 State Street, opened in 1924 as “Channel Lunch”. The main attraction was the pool hall at the front of the building; Channel Lunch had a bar and lunch counter in the back. Joe Ferrario, and Italian immigrant, came to Santa Barbara for the first time on his honeymoon in 1914. He and his sweetheart Adelaida, fell in love with the small town of Santa Barbara and its Mediterranean climate. They decided to make Santa Barbara their home. In 1928, Joe purchased Channel Lunch. The pool hall moved across the street, and the restaurant expanded. In 1933, the name was changed to Joe's Cafe, and it has been a Santa Barbara institution ever since. For more than 80 years, Joe's has been the colorful setting for many generations of diners. In the early days, during prohibition, only near-beer and Shirley Temples were served at the bar. The restaurant continued to serve excellent Italian specialties that Adelaida created, and hearty American food, as well. However, once prohibition was repealed, Joe's was one of the first establishments in town to let the good times – and the draft beer - roll again. Joe's has always been a part of the downtown scene, no matter what the era or the occasion. It was a local tradition for men riding in the Old Spanish Days Fiesta parade to line up in front of Joe's, each astride his favorite horse. Joe and his son would serve the cocktails to the riders who were dressed in their Spanish finery, and the riders would never leave their saddles. Many Santa Barbara families would send their kids downtown to Joe's on Sunday afternoons, to pick up a family-style Italian dinner. Joe's staff would make sure that the dinner – and the kids – made it safely home in the back of a cab. And during World War II, Joe's was almost a home-away-from-home for Marines who were stationed at an air base that was located near the site of the current Santa Barbara airport. The Marines enjoyed the friendly atmosphere of the restaurant and the potent libations at the bar. The locals treated them like family, and often helped them to find odd jobs for extra money. Joe's Cafe has been witness to the tides of change that ebb and flow with the passing years – although there has been little change at Joe's Cafe. Today, Joe's Cafe is located at 532 State Street. You will find an authentic 1930s ambiance, friendly staff, good food that is moderately priced, and, as promised, the strongest mixed drinks found just about anywhere. At lunch and dinner, the fare is hearty and delicious. Try their famous French dip sandwiches, or a New York steak. It seems that the continued success of Joe's Cafe can be traced back to Joe Ferrario, the original owner. He was a genial host who understood hospitality, and his recipe for creating a home town restaurant beloved by all has ensured its success for nine decades. We are all counting on many more years of good food and good times. February 16, 2011 - UPDATE - Cominichi's has moved! Visit them at their new store: 410 E Haley St.
Every year at about this time, I start to get the "spirit of Fiesta." 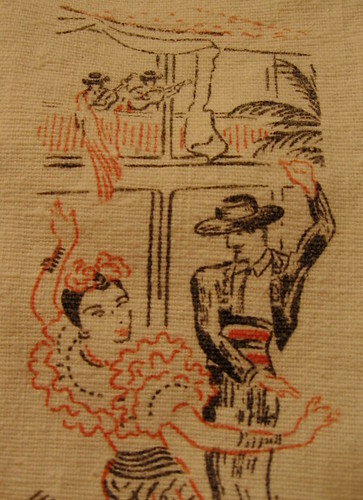 I get out the Mexican shawls, the terra cotta bowls, the crepe paper flowers, and I dig through the closet until I find my little vintage fingertip towels with the Spanish dancers....they look like they are at the El Paseo Restaurant, dancing to the romantic music of Flamenco guitars. I found them at Cominichi's, more than 20 years ago. 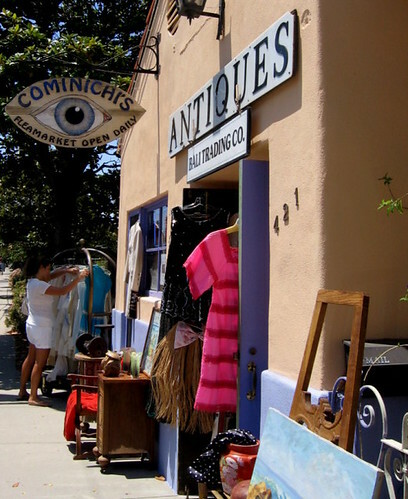 Cominichi's has always been one of Santa Barbara's favorite vintage stores. 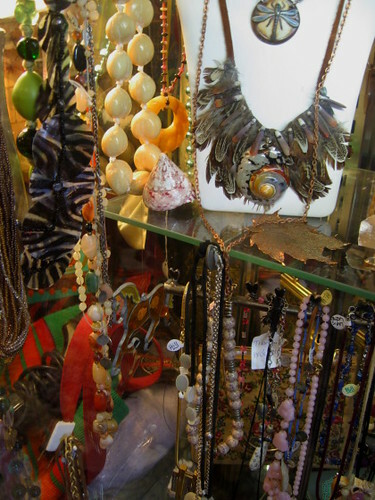 Then, it was located in a little shop right above De la Guerra Plaza. To reach the store, you climbed a steep staircase that was lined on both sides with embroidered shawls, satin nightgowns, hats, and beaded cocktail dresses; shoes and purses were displayed at the edges of the steps. 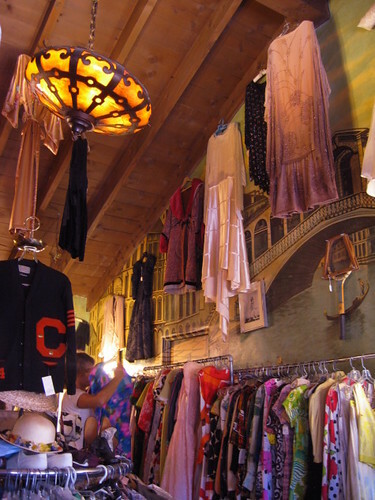 And the store itself was a sight - there were fabulous feminine fashions from every decade, hung on the walls, on racks, and strewn with girly abandon on tuffets and chairs, padded hangers and velvet chaises. 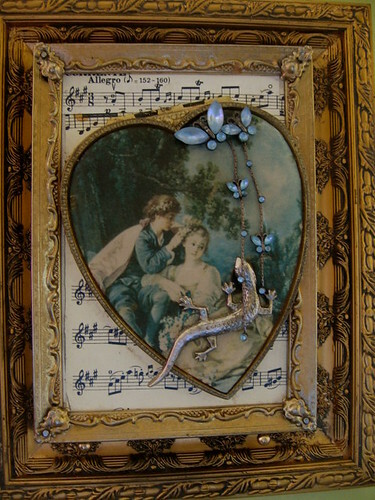 It was a boudoir, a lair, really, with furniture, framed pictures, articles for the toilette, darling home fashions, shoes, handbags, yards and yards of vintage fabric, and lace, feathers, gold, silver, sleek, soft, cool, hot.....It was like an all-girl clubhouse, a place to play dress up and vamp in the mirror. I loved that place. 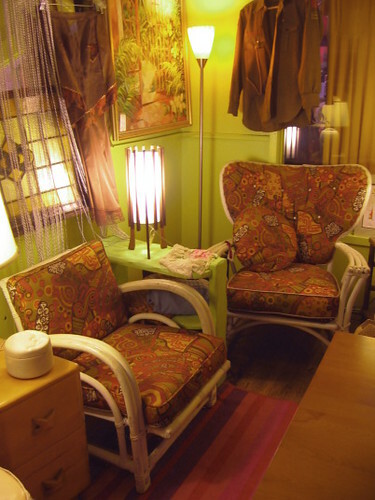 And although there have been several other Cominichi-incarnations over the years, Gina Comin has continued to bring the best selection of vintage wares to Santa Barbara. Now you can get them at Cominichi's at Mom's on Laguna Street. 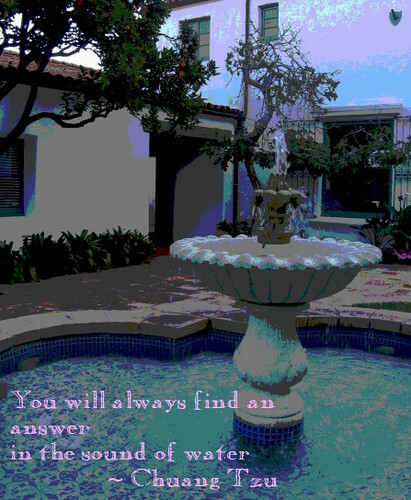 Mom's was one of the original Italian restaurants in Santa Barbara, a true family favorite for many decades. When Mom's closed, many of us were concerned that the beautiful old building would be torn down or rennovated. But thankfully, it was preserved, and transformed into Cominichi's at Mom's. 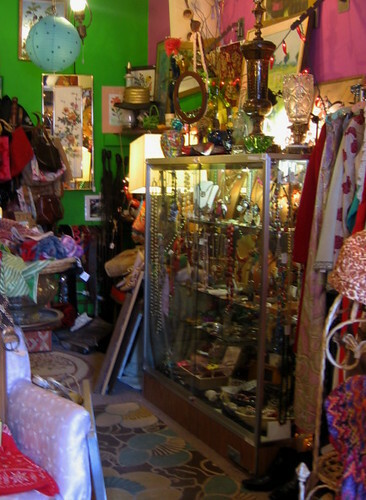 It's full of vendors who bring together an amazing collection of vintage clothing, furnishings and artwork, with fresh inventory added regularly. There is even a vendor who sells a line of new organic cotton clothing. 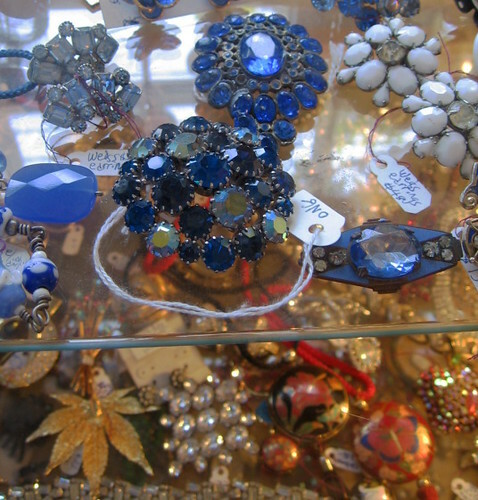 There are several jewelers and artists, too, who display their creations. It is a vintage velvet creation from the 1940s, in perfect condition. 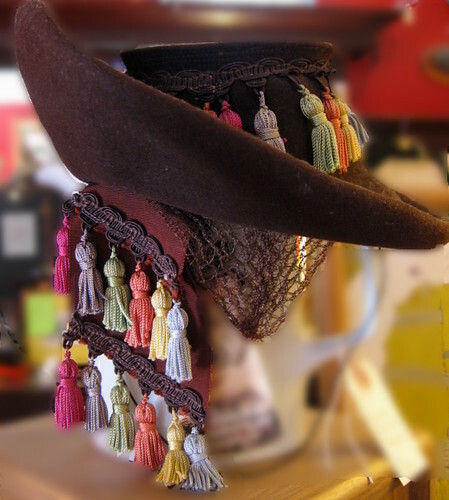 It is a frivolous , fun little hat, with netting and tassels and the perfect amount of sizzle for a dashing caballera. I think it would be the perfect thing to wear to Las Noches de Ronda, a huge Fiesta party in the Sunken Garden of the Santa Barbara Courthouse, where you spend the evening watching Spanish dancers in the warm light of the August moon. And Cominichi's has more than just clothing. 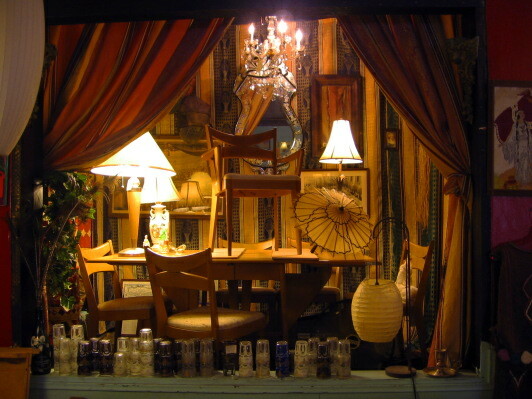 They have books and lamps and fans and flags, games, dishes, postcards and curtains, shoes and ashtrays and statues and pictures - interesting collectable items, accessories and home fashions from every decade. And, they are displayed in a way that our original Mom would approve of, I'm sure. The prices are reasonable, and it seems there's always something on sale. The vendors take turns acting as host or hostess at the shop, so you can meet them and ask questions, too. You'll see beautiful, locally-crafted artwork and jewelry, and some of the "living examples of the absolute best" from the past 100 years of style and fashion - items that, although markedly vintage, are absolutely fresh in a modern setting, too. you might catch a glimpse of the murals from the old Mom's restaurant, where the boats still glide along an Italian canal, and offer you a ride into days gone by. I'm writing to give everyone an update on the demolition of "Mom's Italian Village" (current site of Cominichi’s). There is a pretty great history involved in Mom’s since it began serving Santa Barbara in the 1930’s . Every Italian family I know, including my own, has had many a celebration there. As children my sisters and I were fascinated by Mom’s Italian Village, with its detailed ironwork, bar made of one single plank of aged Honduran Mahogany, its fabulous mural of Venice, the etched glass windows depicting lovers in a gondola. My nona Assunta would take us to the map of Italy and show us where the town Crespano Del Grappa was featured as the place both the Signor family and my own were from. In the 1940’s Mom and Pop Signor took in service men, showing their WWII patriotism by feeding and housing the soldiers and service men in bungalows then on the property. Also during this time there was a professional ball field located in the next block (where the City of SB now has a lot) and Mom’s was a regular pre-game and post-game stop for many. and so many people remember weddings, birthdays, anniversaries, life’s milestones and other important occasions. Mom’s closed due to a series of events, including changing community demographics, the El Nino floods, and a Signor family tragedy which claimed the lives of Mom and Pop as well as a brother in law. Transition house eventually purchased the property, and a series of short lived enterprises tried to make a go. Five years ago (8 years after Mom’s closed) Cominichi's, a long-time local business moved to the location. The community really rallied around to support Cominichi’s and there was a tremendous and renewed interest in the history of Mom’s. In the last 5 years of business at the Mom’s location, not a day has gone by when someone didn’t come into the shop just to feel the nostalgia of an earlier time or tell a story about their memories of Mom’s. Time waits for no man, and in January of 2011 the Mom’s Italian Village building will be demolished to make way for affordable housing and infant care for local families in need. Gina Comin, owner of Cominichi's, wants to make sure that Santa Barbarans are aware that beginning January 3, 2010 Cominichi’s will be open for business at 410 E. Haley Street (between Laguna and Olive). Parking is plentiful and free at the corner of Haley and Laguna.